This image, called “Hide and Seek,” is a bit different, because I started with an idea of a feeling I wanted to convey, then commandeered my daughter as model to pose for me. I wanted to convey the fears and insecurities that exist in childhood alongside the innocence. One of my favorite songs, by my favorite band, is Comfortably Numb by Pink Floyd. Two verses talk about childhood. 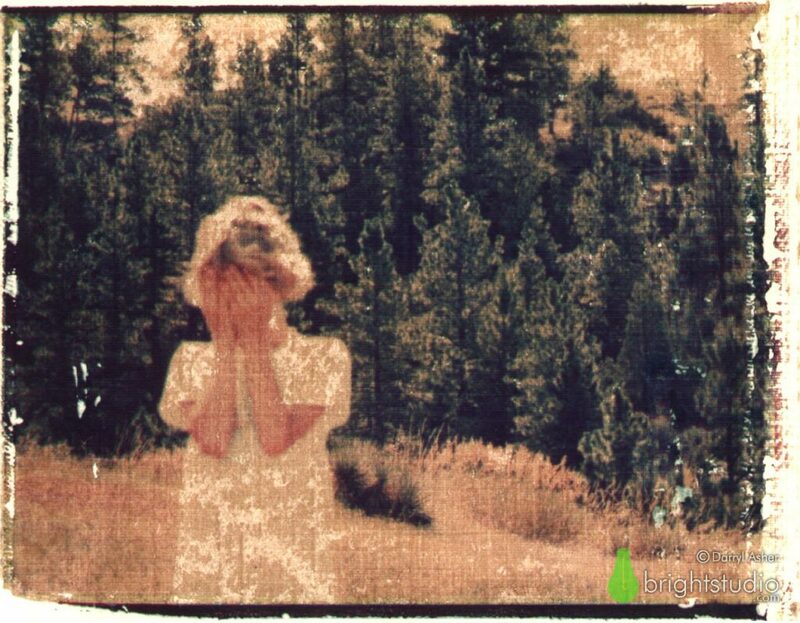 I believe in the power of images to communicate things I “can’t explain” and “cannot put my finger on.” From a technical aspect, I chose to make this image a Polaroid transfer to give it a timeless, worn appearance, and a dreamlike quality. There is no Photoshop editing, just an image shot on slide film, exposed to Polaroid peel-apart film, then transferred to linen finished printer’s stock. The final print is a scanned and enlarged version. The composition is one of several I tried. My patient and cooperative daughter let me drag her around our yard and pose her in various scenes. If you look closely you’ll see that the focus is on the woods, not the child; she is slightly out of focus. In story-telling, the woods have always been places of mystery and fear; it’s no different here. She also placed low in the frame, emphasizing her vulnerability. The title comes from the childhood game we are all familiar with, and a girl covering her eyes seems to indicate she is playing the game. But the title is a misdirection, and the pose is ambiguous. Without the title, you might assume the child is crying, or trying to hide her eyes from something frightening in the woods. She appears to be deliberately turning away from the woods and hiding her eyes. The fearful thing in the woods can be whatever the viewer imagines, or perhaps whatever the viewer feared in their own youth. In my own mind, I think of it as a fear of growing up and all the responsibilities that accompany it. I like how this turned out; an ambiguous image that at first glance looks like it’s celebrating the innocence of childhood, but on further study confirms what we all know: childhood is complex and full of mystery.